7 Best Deadlifting Shoes In 2019 For That Perfect Powerlift! Deadlifting is a specific exercise in weight training. It is designed to test, and train, your limit for how many pounds you can lift. A lifter will raise the loaded bar (also known as a barbell) from the ground up to waist level only, then release it back down to the ground. This requires immense amount of support from your entire body, and that entire pressure falls on your feet. To protect your feet and provide them the support they need, you need best shoes for deadlifts. This is why to protect your feet from immense pressure of the bar that will fall on it, we wear different type of shoes, specially designed to help and support our body but most importantly support our feet and it is important to get the pair of best deadlift shoes to keep from injuries. Strength is the foundation to performance. It’s also crucial to be comfortable while performing. Nowadays, shoe technology has been researched, tested, and refined for every sport imaginable. You can have durable, yet lightweight, supportive, yet breathable. You no longer have to sacrifice comfort for performance. 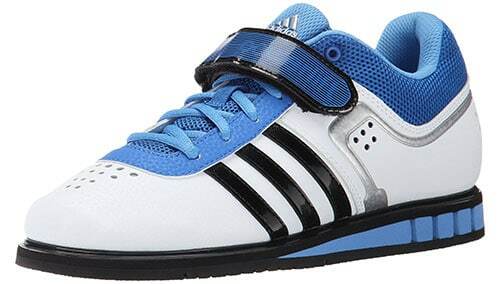 Below are a list of the 7 best deadlift shoes in today’s market. Some specialize in specific things, but all will contribute to you being a better deadlifter. These shoes were specifically designed for deadlifting. For a specialty shoe, you can’t go wrong this this choice! The soles offer an anatomical last, to better fit the shape of your foot, as well as non-marking (gyms love this feature). In addition to being a high top, this shoe has two lateral straps – for an individual and precision fit. This shoe also has great side support, allowing you to spread your feet without the fear of rolling an ankle. This fabric and leather shoe is offered in a few different accent colors. If you’re willing to make the investment, these shoes won’t steer you wrong. If I had to pick one absolute best pair of deadlift shoes then Sabo will be my pick. TIP: They are listed in European sizes, so be sure have an accurate size conversion chart for your specific shoe size. This is a low top, weightlifting specific design is made of synthetic material. It has mesh/ventilation holes in the toe, heel, and inner and outer sides of the foot. It also has a cushioned collar, lateral strap, removable insoles (so you can put in custom ones if desired), and wide-sizing for comfort. What really makes this shoe stand out is its extra flat, non-rounded edges (on the edge of the soles). This allows for greater stability. This shoes does have a high density wedge (like the Olympic shoes) that is shock absorbent. The soles are also non-marking, making them great for gym and court surfaces. They come in a variety of colors and accents. 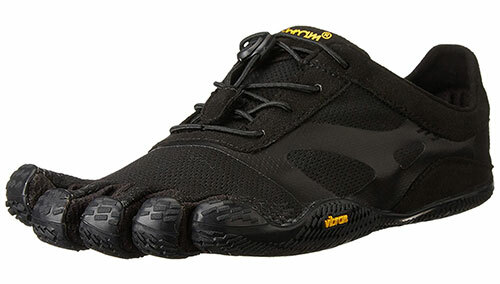 This synthetic, low top shoe comes in a variety of colors. The POWERBAX midsole adds comfort, while the supportive heel backing add stability. Mesh toes and tongue, as well as on the sides achieve breathability. This well-rounded workout shoe offers flexibility for both power and agility. This is a great versatile all around workout and training shoe. Really, the whole Reebok Crossfit shoe line-up is worth glancing over. You might find one that suits you better than another. They come in a variety of different styles – high top and low top. 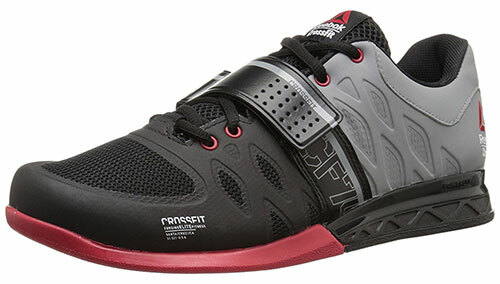 Case and point for the point made above, these are another Reebok Crossfit shoe. The lateral straps and heel cradle keep your feet in prime position during movements. The synthetic canvas design offers breathability, while the toe specific area has a protective barrier for your workouts. This shoe is also high top, offering ankle support, An OrthoLite sock liner keeps you cool and comfortable during your workout. Its multi-surface outsole is thin, yet firm sole providing greater traction and stability. 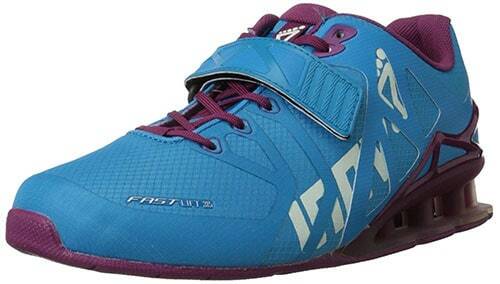 This synthetic weightlifting shoe claims to be the lightest in the market! A meta-flex technology gives the forefoot greater flexibility, allowing for more comfortable movement and versatility when transitioning to other workouts. An external heel cup provides greater stability against lateral movements and assisting in a stronger stance. This shoe has mesh over the toes for breathability, and a lateral strap for a snug fit. This shoe, offered in a variety of colors, is designed for gym use. 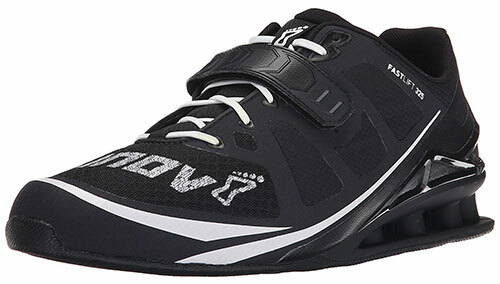 Inov-8 lives up to their name. Their shoes show a lot of technology and advancements. They have their basis covered! 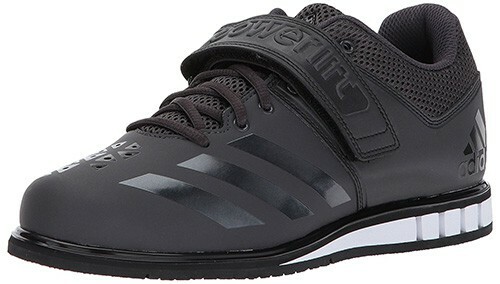 Believe it or not, a lot of dead lifters prefer this seemingly simple, non-athletic looking shoe. 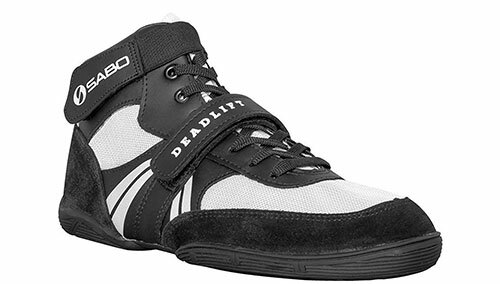 It meets all the requirements a deadlift shoe should have, AND is cost effective and versatile (uses outside the gym). 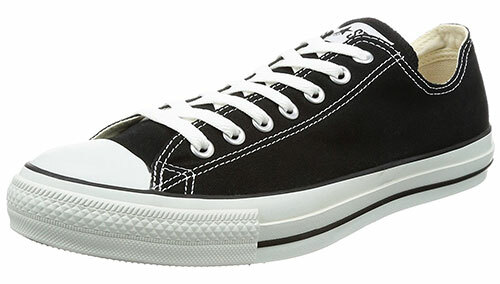 High top, low top, black, white, or pink, you can choose the Converse shoe that fits your personality and vintage style. This durable canvas top is light and flexible, while the sole is flat and solid. This is a great shoe for beginners, or those on a budget. The next time you’re at a gym, look around. You might be surprised by how many Converse shoes you see. TIP: Be sure to identify if the product listing references a men’s shoe size or a women’s shoe size. If the Converse shoes didn’t look like an athletic shoe to you, you won’t know what to do with these shoes! However, let’s look at what they have to offer… A polyester, mesh, and textile material allow for a lightweight design. They have an inside lining that give a “next to skin feel”, as well as anti-microbial properties (for those stinky feet). They offer a padded tongue, and a speed lacing system. And for those of you that note craftsmanship, these are a handmade item. Give your toes, and feet, that extra spread with individual toe slots. For those that wish to deadlift barefoot…this is as close as you’re going to get! This synthetic shoe comes in a variety of colors. 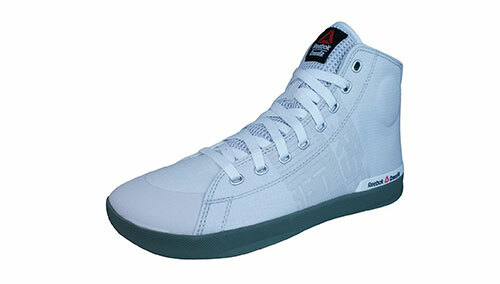 It is a high top, lace shoe, with a padded collar for comfort, and a mesh tongue for breathability. The sole is flooded with small rubber teeth, so you have traction and stability during your lift. It is also equipped with a carbon rubber heel, for added rear foot support. 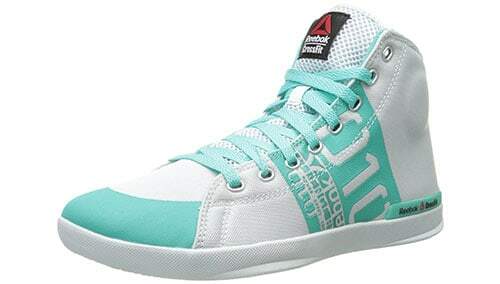 Note: Reebok also makes low top versions of their crossfit shoes. This low profile shoe is one of (if not the) lightest in the market! It has a comfortable inner mesh lining for breathability, and a removable foot bed (so you can insert a custom one if desired). Also has sticky rubber (the same as used on climbing shoes) for added traction and grip. It also has a lateral strap for a custom, snug fit. With a meta-flex technology, it allows for your forefoot to have flexibility when you need it. With the external heel cage, it provides extra stability and support in the heel and midsole. These shoes are designed with every advanced technology known to shoe making. They won’t disappoint! No matter what shoe you pick, be sure to try them on first! Every brand, and even various shoe models, could fit differently. You also want to make sure you bring/wear the socks you’ll be wearing while deadlifting. As each sock differs in thickness, it could affect the fit and feel of your shoe. Lastly, if you have custom insoles, bring those too! See if they fit in your deadlifting shoe, along with your socks. 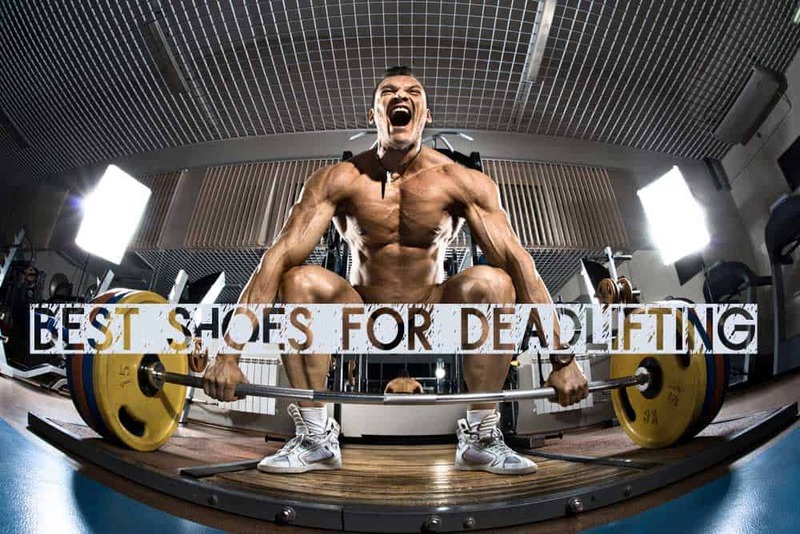 You can learn more about buying them on our Deadlift Shoes Buying Guide. There’s a fine line when it comes to shoe fitting. Too tight could restrict proper blood flow to your feet causing a loss in them functioning. Too loose means a sloppy fit and not enough support, potentially creating a hazard for yourself. Take your training seriously, and be sure to purchase the right shoe for you! TIP: some people wear socks that come higher up on their leg, so they protect their shins from the bar scraping against it. When trying them on in stores, the representative helping you out should also have some tips and pointers about deadlifting shoes and help direct you to what you’re looking for. I hope all this information helps you, as you explore your own strengths through the world of deadlifting. Throughout your deadlifting career, I’m sure you will venture out and try a variety of brands and styles. Fine-tune what’s best for you and your style as you progress in maximizing that weight you add to the barbell. Don’t ever limit yourself in what you can do! Here’s to being strong, stable, and healthy!